There is nothing like visiting a Choose and Cut Christmas Tree Farm and picking and cutting your own live Christmas tree. You know it’s what you want, and you know it’s fresh. Your biggest decision is choosing your “perfect tree” from among the thousands. 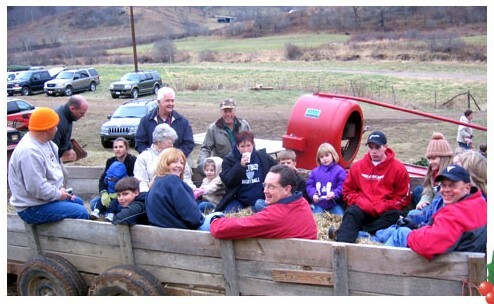 At RRR Tree Farm – Laurel Knob we’ve seen families jump off the Choose and Cut Hay Ride , point at a tree and say “I want that one.” Most commonly, however, they’ll spend hours choosing. However, it’s not unusual for them to come back to that very first one. It’s just fun to meander among the trees on the great search. Once the decision is made and the tree is marked with the tag we provide, we encourage you to cut it down with a hand saw (bring your own or we’ll provide one). We have staff in the field to cut it for you if you prefer. The tree is then carried to the bailer and bailed for you to take home. We will load the tree on a trailer and take it to your vehicle. Y’all then get back on the hay ride to go back to the Christmas Shop to get some more hot cider. You may visit our RRR Tree Farm – Laurel Knob Tree Farm by choosing one of our Choose and Cut Christmas Tree Packages or just come as a Day Guest. Guests with package vouchers will have paid for a 7′ tree at their lodging. If you wish extra height and/or additional trees, you pay for that at the farm. Day Guests will pay at the farm: $50 for a tree up to 7′ and $8/ft. above 7′. Extra trees are available for $40 up to 7′; it’s $8/ft above 7′. You may buy as many you wish.